How Australia’s revolutionary wave technology could produce power and fresh water with zero emissions. The ocean has long been one of our closest allies. It’s allowed us to discover new lands, feed entire communities, and cool off in the summer heat. But it’s only very recently that the ocean, in all its vastness, has finally become an efficient and reliable source of renewable energy. 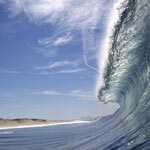 Researchers at Carnegie Wave Energy Limited in Western Australia have just redrawn the boundaries of wave energy technology by creating a system to generate efficient electricity and produce fresh drinking water through reverse osmosis. The technology, named CETO (after the Greek goddess of sea monsters), is powered by a system of buoys anchored to the ocean floor. As waves roll in, the buoys move up and down, pumping high-pressure water to shore. This piston-like pumping action shoots water into hydroelectric turbines and creates electricity. Unlike previous wave energy systems, CETO’s buoys are fully submerged. The buoys aren’t visible from shore, stemming complaints about the technology marring beautiful costal views. In addition to aesthetics, CETO’s full submersion provides another benefit: safety. By operating under the surface, CETO’s buoys are protected from the elements, allowing them to withstand harsh conditions that may be present during storms, and remain out of the way of watercraft. Where CETO shines brighter than other, however, is in its ability to produce fresh water in addition to electricity. The hydraulic system that generates energy can also produce fresh water more efficiently and cost-effectively than any other wave energy device. Previous wave energy systems rely on outside electricity to power pumps that draw in huge amounts of seawater for the desalination process. CETO takes out the middleman. The electricity that would have been required to pump water is removed from the equation, and CETO’s buoys pump high-pressure water directly to shore. This cuts greenhouse gas emissions from the process entirely, and reduces operating and capital costs. The key distinguishing factor with CETO’s process is a way to potentially generate electricity and water with zero emissions. Two valuable outputs with one streamlined system. CETO units have been deployed off the coast of Western Australia, but have yet to produce scalable results with respect to MW energy production and desalination. A second stage of the project is set to connect their buoys to the grid in early 2014. We’ll be revisiting this topic later in the year to see if wave energy technologies like CETO can deliver on their promises when put to the test.